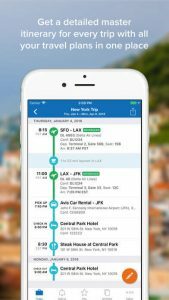 TripIt® from Concur instantly organizes all your travel plans in one place. Simply forward travel confirmation emails to plans@tripit.com and TripIt will create a master itinerary for each of your trips. Now you can access your plans anytime, anywhere—for free. Experts agree! The New York Times, Forbes, CNET, Inc., and many more recommend using TripIt. After booking, simply forward your confirmation emails to plans@tripit.com and TripIt will instantly create a master itinerary for each of your trips. You can opt to allow TripIt to automatically import travel plans from your Gmail, Google Apps, Outlook.com or Yahoo! mail inbox, so you don’t have to forward confirmation emails. Access your travel plans on your smartphone, tablet, computer or wearable device anytime, anywhere. Sync TripIt with your calendar, so your travel plans show up alongside other meetings or events. Easily share specific plans, or your entire itinerary, with anyone. Help shape your future flying experience by providing anonymous feedback on your flights. For frequent travelers, TripIt Pro gives you all the power of TripIt, plus real-time flight alerts, seat tracking, alternate flight finder, fare refund notifications, point tracking, and more. Choose all the benefits of TripIt Pro, and your first year’s subscription will be charged to your iTunes account once you confirm your purchase. Price varies by region and is currently $48.99 per year in the U.S.
TripIt® is brought to you by Concur, a leading provider of integrated travel and expense management solutions. Concur takes companies of all sizes and stages beyond automation to a completely connected spend management solution encompassing travel, expense, invoice, compliance and risk. Concur’s services are trusted by more than 35,000 clients around the globe, and over 45 million end users process travel and expenses with Concur.